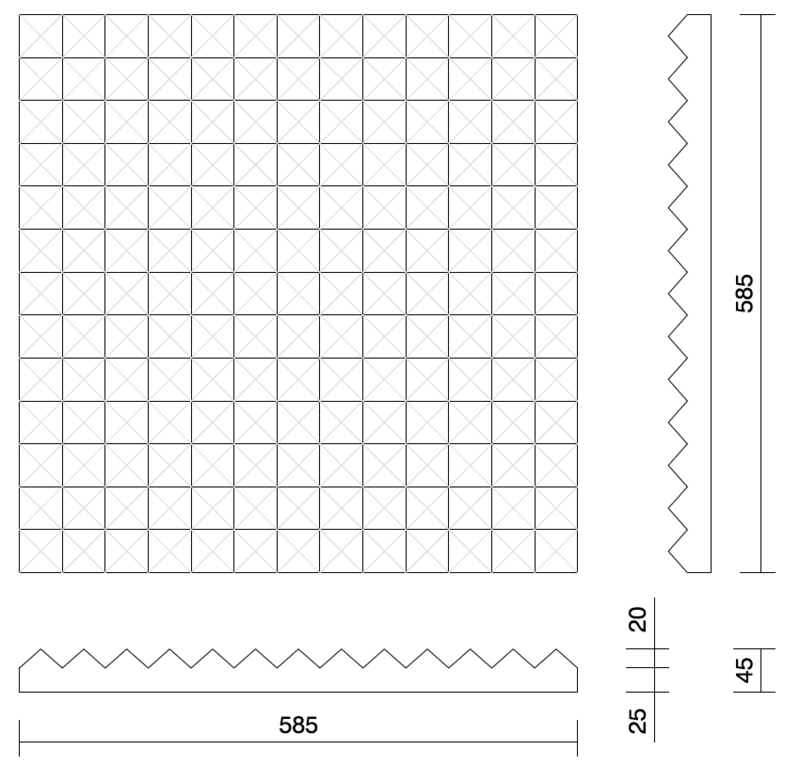 Fireproof acoustic absorbers (pyramid-shaped) presented in 585 x 585mm panels (thickness of 45mm). Self-installable, glued mounting with Skac Adhesive; sold in units! Basotect® acoustic foam, in white or light grey, fire class: M1. The JAFRA FR panels are next-generation fireproof acoustic absorbers with a classic pyramid design. They are present in many music studios around the world. They are made of high quality fireproof Basotect® foam, which combines high sound absorption efficiency and good fire-resistance, class M1. The carefully-studied pyramid proportions are balanced to obtain a product with an attractive appearance and great durability that is easy to mount and gives a high acoustic performance. The pyramid-shaped profile increases the absorption surface, thereby improving the acoustic capacity per m2. This product has an M1 fire-resistance class (BS 476/7), which complies with the requirements set out in the CTE norm (Spanish Technical Building Code); it is suitable for installation in public buildings. Treatment for rooms with reverberation problems that require high sound absorption with the best fire resistance (public buildings), such as: restaurants, cafes, pubs, nightclubs, dance halls, classrooms, dining rooms, conference rooms, rehearsal rooms and recording studios. This product is recommended for the education and hospitality sectors. To obtain the best results, you must cover at least 30% of the surface (ground surface) of the room. Example: Room of 80m2 x 30% = you will need 24m2 of Jafra FR (about 6 boxes of 12 units). The following table gives a guide of the estimated reverberation time depending on the size of the room and the number of tiles installed. State RECOMMENDED for bars/restaurants / classrooms with optimum results in full rooms.